For information about riders under age 18, visit the Youth Rider Guidelines page. If you’re looking for a training schedule or safety tips, those can be found on our FAQ page. If you don’t know your rider number, please email habitat500@hfhmn.org. All riders must check in at Rest Stop #2 and the overnight location. Riders must wear a helmet at all times while on a bicycle. Please watch our safety video before starting your ride. Our sincere thanks to the committee members and volunteers who put the video together! Find the video here. The Habitat 500 team sends out newsletters out each month from March through September each year. 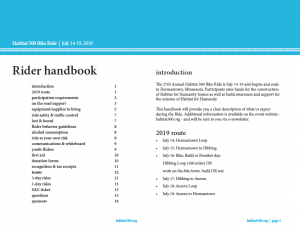 During April, May, and June, two newsletters will go out: one with information for registered riders and one with information for all Habitat 500 supporters. If you’re not already on our list, sign up below! All riders, especially new riders, are strongly encouraged to review the Ride guidelines in the Rider Handbook. In addition, all registered riders must complete waivers as part of registration. If someone else completed your registration for you, please email habitat500@hfhmn.org to receive and complete your waivers!